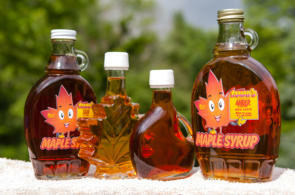 Great tasting maple syrup and maple products at a low price. We are a true Mom & Pop maple shop. Owned and operated by Tammi and Zip a husband and wife team that’s been together for over 30 years. One of our goals when we got into producing maple products was to keep our prices as low as possible, without compromising quality. 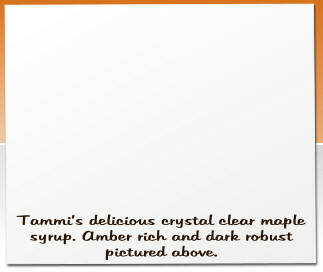 Click to visit Tammi’s Maple online farmstand. We want everyone to be able to enjoy the best tasting sweetener on the planet and the health benefits that comes with real maple products. How we manage to keep our prices low. We own the land our Sugar and Red maple trees grow along with our modest sugar house. We didn’t go out a waste thousands of dollars on over priced maple equipment. Which is very common in the maple world. 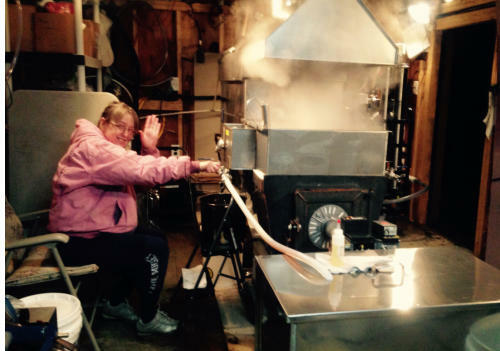 Our evaporator, reverse osmosis and even our sugar house is all Amish made. Saving us thousands of dollars. Might not shine like the expensive stuff but makes outstanding maple syrup. All of our currently tapped trees reside on a steep hillside behind the sugar house. Which makes for a great gravity tubing system using 3/16 tubing to generate high vacuum. No need for expensive vacuum pumps like many other use. All of our sap flows directly from our maple trees to the sugar house without the use of pumps or any manual labor. No need for trucks, gathering tanks or back breaking labor. (Zip’s back is already broke) In fact our sap goes from tree to syrup without any handling. Which is great for making quality syrup and great for the environment. We also make our own labels, created and maintain our website to reduce cost. We are not trying to get rich. We are just trying to make a little income to help pay our land and school taxes. So we can continue to live where we love. Click to visit Tammi’s Maple online farmstand. We do not buy sap or syrup. If you buy from us? The maple sap comes from our trees and the syrup was made by us. Many, many other producers buy both sap and syrup. Some have no clue how that sap was collected or how syrup was made. Ask questions before you buy. We do our very best to pass the savings on to you!! 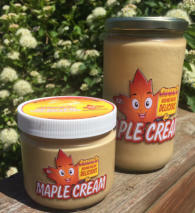 Here you will find maple syrup, maple cream, maple sugar made in the southern Finger Lakes region of New York. Our farm is surrounded by Sugar Hill state forest not far from Watkins Glen, Corning Glass Museum, Seneca, Keuka, Waneta and Lamoka lakes. We are only a couple miles south of Farm Sanctuary. Maple is the ultimate vegan treat!! 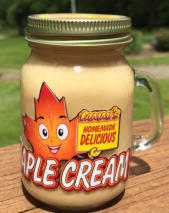 Tammi’s Maple Cream a delicious treat good on almost anything. We now have both amber rich and dark robust in stock and ready to ship. Once again mother nature has treated us with some amazingly delicious maple syrup. We do not buy syrup or sap! We only sell what we make. Thanks Tammi & Zip.